Surat Municipal Corporation will add around 150 buses to its existing fleet of city and BRTS buses by early 2019. With this the fleet size will increase to over 560. 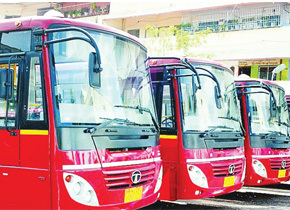 The civic body is planning to run more than 650 buses in the City on a daily basis with target of achieving ridership of 3.5– 4 lakh by the end of March 2019. The aim is to cover the entire city and provide mass transport within 500 metres of last mile connectivity points.